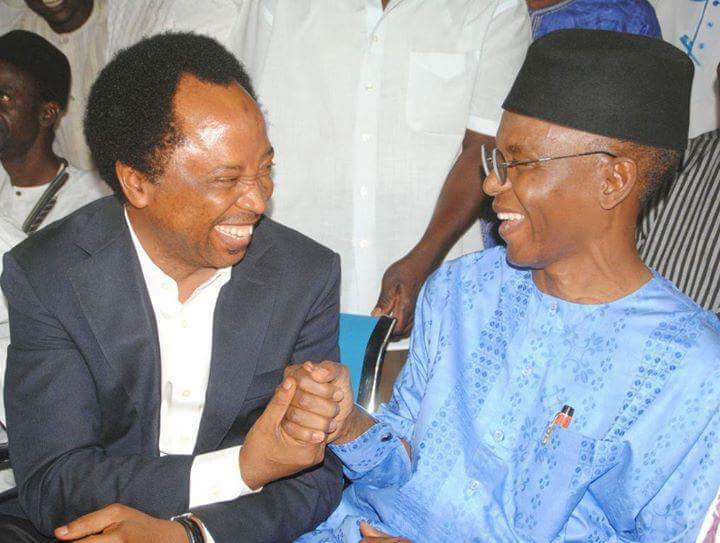 The three years old political quagmire between Kaduna born Activist turned Lawmaker representing Kaduna Central Senatorial zone, Oracle Shehu Sani and fearless Super Cob in the the political jungle of the State, Nasir El-Rufai, appeared not going to end soon. The duo have again opened another chapter of misile with each other over consistent plots allegedly initiated by El-Rufai’s foot Soldiers to recall the Senator back from national assembly in order to mar his young political breakthrough. In a swift reaction on Monday to press conference addressed by Group under the umbrella of Concerned Indigenes of Kaduna Central Senatorial Zone premised on his recall process earlier, Sani described the group behind the move as ”amorphous and fake groups who are nothing but errand boys doing their master’s bidding in the hope that it will buy him peace of mind”. The Senator who spoke through his Special Adviser, Political and Ideology, Comrade Suleiman Ahmed in Kaduna on Monday said, they were “sponsored goons, rabble rousers and Elrufai’s foot Soldiers to distract the Senator and make noise”. “The attention of the distinguished senator has been drawn to a ‘Press conference’ in a Hotel organized by a group without a valid office address. “The group reportedly claim they are working towards a recall of distinguish Senator Shehu Sani. This amorphous and fake groups are nothing but Governor Nasiru Elrufai errand boys doing his bidding in the hope that it will buy him peace of mind. “ELRUFAI is a coward who is afraid of Senator Shehu Sani in the upcoming 2019 election and is now resorting to recall through his boys. For close to 3 years Governor Elrufai has been using this sorts of fake groups to fight his cause and all have failed. “Governor El-Rufai has created jobs among youths in thuggery and fake press conferences. What were they doing to think of recall in less than a year to general elections.where have they been since”, headded. Earlier, group under umbrella of Concerned Indigenes of Kaduna Central Senatorial who described Senator Sani as a rogue senator and a man who made his way through deceit, blackmail and subterfuge while hiding behind a veneer of human rights activism said, it is prepared to initiate a recall process of the senator representing Kaduna Central Comrade Shehu Sani. Leader of the group, Aliyu Saidu, Rigachikun, who addressed press on behalf of Concerned Indigenes of Kaduna Central Senatorial District, gave the lawmaker’s constant criticism against President Muhammadu Buhari and Kaduna State governor, Nasir El-Rufai as reason for the recall. “I will like to begin this address by drawing your attention to the fact that I was at the heart of Senator Shehu Sani’s campaign machinery in my capacity as Deputy Director General of his campaign team. All of us were major stakeholders in the President Buhari’s project as bonafide indigenes of Kaduna State. “In 2015, after two successive political misadventures, the central finally gave Senator Shehu Sani chance to represent them at the Nigerian senate, at a time the Buhari-led wind of change was sweeping across Nigeria. Prior to that, Senator Shehu Sani was a political nonentity who was roundly defeated in his two previous outings. Given the assurances that having the incorruptible President Buhari at the center would moderate the behavior of the political class, our people took the political risk of sending Senator Shehu Sani to the senate. “As it turned out, Senator Shehu Sani, will come back to bite the fingers that fed him. His first assignment as a senator was to ridicule the president’s wife during inauguration and will later conspire against the President and the party in the national assembly leadership elections, and in doing so, becoming a prominent figure in a senate that is committed to undermining every honest effort of the Buhari administration against the will of his constituents. “Those who know Senator Shehu Sani are not surprised by this turn of events knowing the rogue senator as a man who made his way through deceit, blackmail and subterfuge while hiding behind a veneer of human rights activism. With this development, it is not certain whether APC reconciliatory committee headed by Senator Bola Ahmed Tinubu will be anything close to success in Kaduna state.